the Belgian judoka found himself Monday night hours after winning his first-ever Olympic medal. 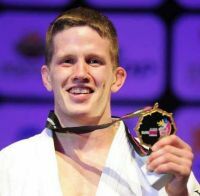 Van Tichelt won bronze in the 73-kg judo competition on Monday. Naturally, he went off to Copacabana Beach that night to celebrate the achievement. And that's where things went awry. face. He was taken to the hospital after the incident. The thief, who was reportedly Brazilian, came away with a cellphone, but, crucially, not with a bronze medal. That allowed Van Tichelt to take the epic picture (pix on headline above) the following day. The Belgian Olympic Committee released a statement confirming the details, and saying that Van Tichelt didn't require treatment at the hospital. He appeared at a media event the next day with a black eye, and, undoubtedly, a smile on his face. Van Tichelt now has more than just a medal to commemorate his Olympic success.